My new dog Wally has been with me for about 2 months now. We seem to bond a little more every day as we continue to figure each other out and work together on navigating obstacles in our training path, both figuratively speaking and sometimes even literally! “Stay” inside the house was the second command he mastered fairly quickly, right after “sit.” I’m currently working with him on holding his “stay” around distractions in different environments, both indoors and outdoors. Let me tell you that it’s a wonderful way to engage both of us mentally! Wally’s learning to stay focused on me, and I’m having to come up with ways that motivate him enough to find me more interesting than distractions. In order to practice the stay command around distractions, your dog should already be able to hold a stay position in a neutral environment, at least for a few seconds. Along with sit, down, and come, the stay command is considered one of the basic commands every polite dog should know. 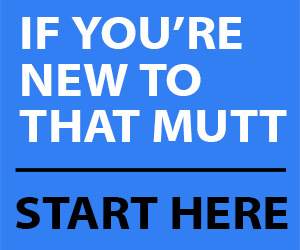 Start by teaching your dog to stay in a neutral environment rather than including distractions right away. This will set him and yourself up for success. Like with all dog training, consistent and short sessions work best. Figure out what motivates your dog and use it to your advantage as a reward. This could either be tasty high value treats, a favorite toy, or praise and lovings from you, his owner. Along with the reward, use a cue word or a clicker when your dog performs the desired behavior and stays put. Keep him from running out of an open door and/or into a busy street, knocking over fragile aunt Frannie, or chasing the neighbor’s cat. Be in control of your pup and keep him from leaving muddy paw prints on your carpet after that awesome romp around the wet yard, keep him put in the tub during bath time, and out of your feet when fixing/eating dinner. Enjoy your dog paying attention to you and looking to you for guidance. I personally decided to work on Wally’s “stay” around indoor distractions first before we moved on to outdoor distractions. That’s because it’s an environment I’m more in control of as opposed to the busy outdoors. Decide which distractions you want to work on, then start with short distances at which you ask your dog to hold his “stay” and gradually increase them. 1. A doggie backpack to put him into a working mindset. This helps, especially when running errands and when working with him outside. He’s able to focus considerably better on me when wearing one, especially when we’re surrounded by animal distractions. 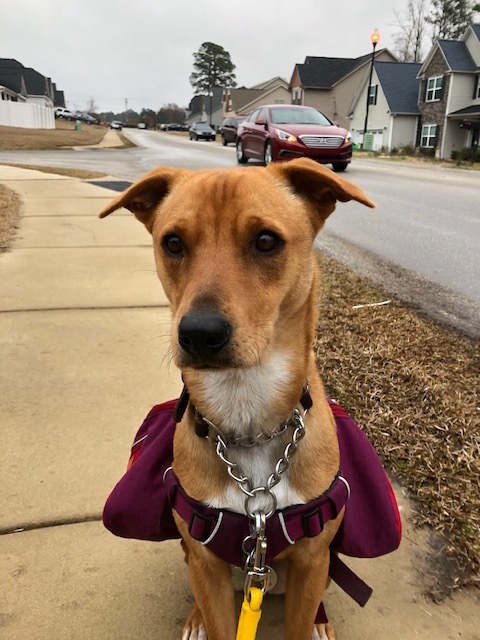 Wally’s wearing the Ruffwear Commuter Backpack in the pictures throughout this blog post, but there are several other brands who make doggie backpacks as well (Outward Hound, Olly Dog, and many more. Just do a Google search). 2. A leash in order to redirect him when something breaks his “stay. This also helps keep him put when working on stay with an open front door, people visiting, or a highly distracting outdoors environment. Multifunctional leashes work best for this purpose because they feature a double ended clip. 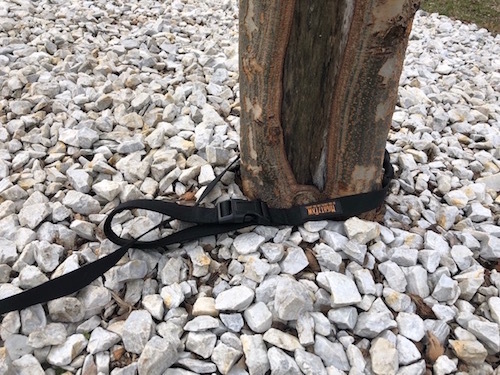 Mighty Paw’s long dog leash works great because it features a handle with a buckle that can easily be clipped around a sturdy object or tree. 3. Martingale collar for a quick correction. 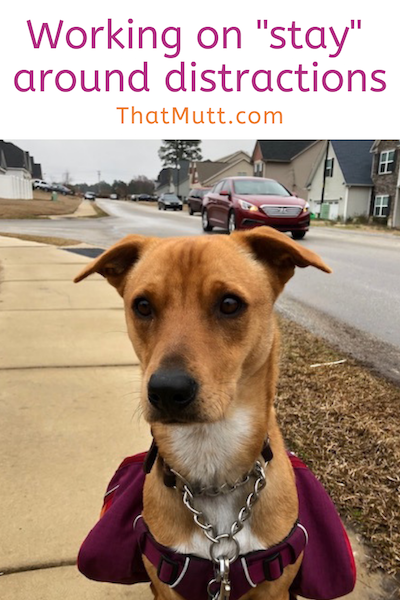 I currently use Mighty Paw’s leather martingale collar on Wally because I love leather accessories for dogs and this one is extremely durable and effective (it’s a mix of leather and a stainless-steel chain). I also use and recommend a head collar for training purposes. 4. Treat pouch filled with high value treats. It’s super helpful having treats handy when you need to reward good behavior and not having to dig around for them in your pockets. 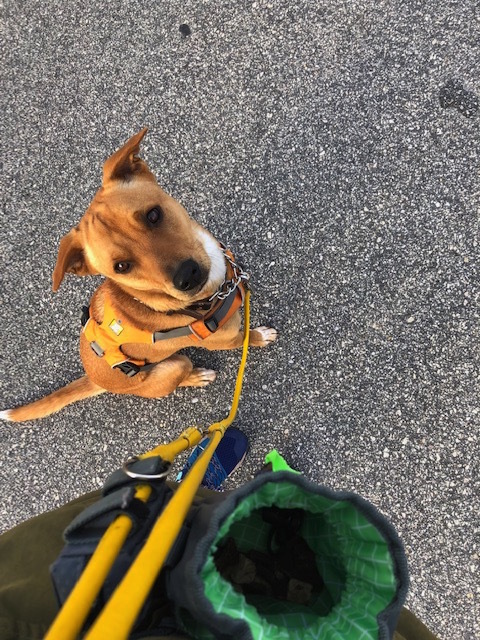 I use Mighty Paw’s treat pouch because it also has a slot for my cell phone, keys, and features a poop bag dispenser. 5. Another dog who already knows how to stay around distractions! Goldendoodle Lulu is a therapy dog and extremely well behaved, so having her around on walks with Wally helps him simply by being able to copy her behavior. 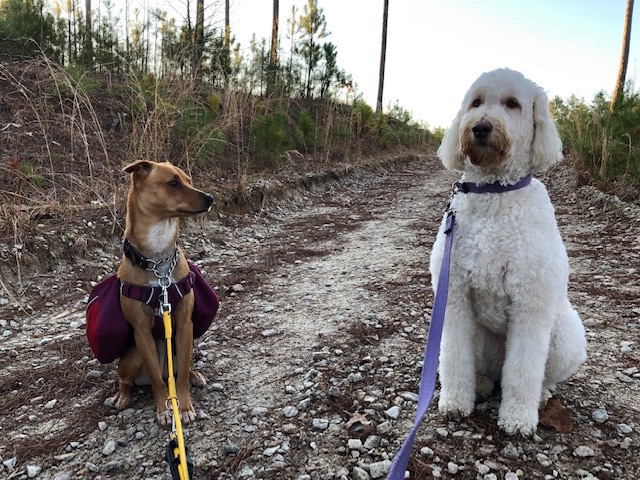 Wally and his friend Lulu in a sit-stay on a walk. Wally’s wearing a backpack and a leather martingale collar. The first inside distraction I worked on with Wally was his food. 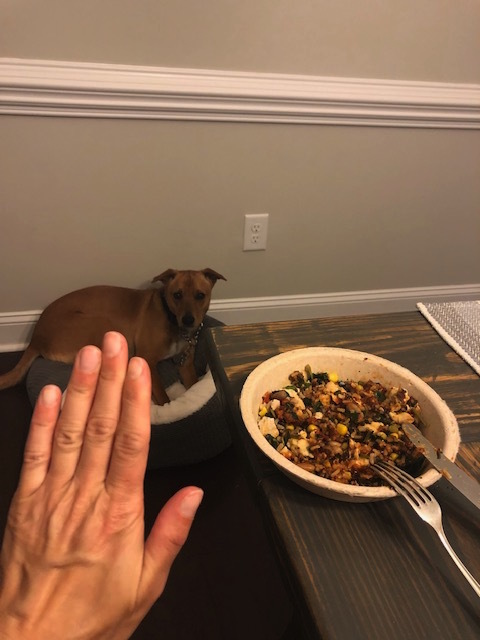 Polite doggie behavior around any type of food is very important to me personally, so asking him to stay reliably before digging into his raw meals was a training priority for me. 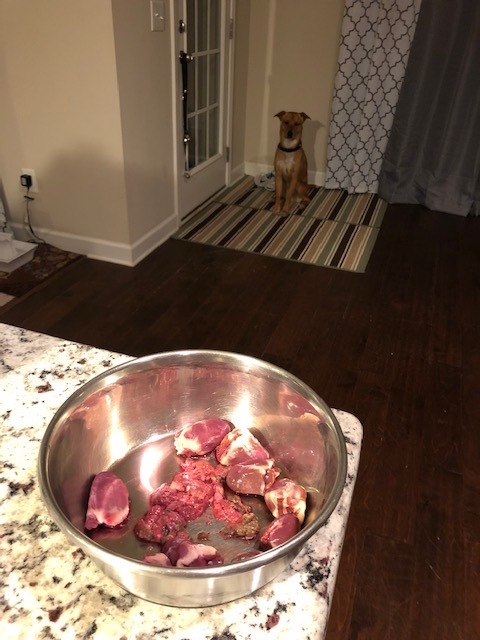 I first asked him to hold his stay while he was sitting next to me and his filled bowl was sitting on the kitchen counter right in front of us. I gradually increased the distance between him and the food bowl, and am happy to report that he can now hold his stay 10 feet away from the bowl. His reward is mealtime! See my post: Keeping your dog calm before meals. Next on my list of training priorities was him being able to stay put when friends are visiting and first coming through the door. I found it helpful to instruct guests to ignore Wally at first. This helps in keeping his level of excitement low and being able to better concentrate on what’s expected of him. I would first leash him to my fridge using a multifunctional leash, and this method worked like a charm. When working on this challenge, you could ask your pup to “stay” on his bed, in his open crate, or any other place of your choosing when guests first arrive. Keeping a leash on him certainly helps during the initial training phase. You could attach it to a banister or a furniture leg as well. Interestingly enough, the sound of the doorbell doesn’t represent any form of distraction to Wally at all, so that works out in my favor! Don’t think I lucked out too much though…check out the section on our personal challenges to find out what REALLY gets him and keeps him from concentrating on me! Something to incorporate with your pup when working on his “stay” at the sound of the doorbell is to ring it after you come back from a walk. Have your pup “sit” or “down” by the front door, and ring the door bell. Reward him for staying put with high value treats like cut up hot dog, green tripe treats (my favorite training treats), or anything else that has a distinctive smell to it. I used to practice this with my pups Missy & Buzz and it became a ritual for us to ring the door bell whenever we came back from our walks. It had the wonderful effect of not causing crazy excitement when somebody other than me rang it. If you want to take indoor distractions up a notch, practice the stay command when you’re out running errands at pet-friendly locations. Try exercising your dog physically to burn some energy before you take him out on those training adventures. He’ll likely be calmer and able to better focus on you. Most of them are dog friendly, but double-check their respective store policies before taking your dog. Also check to see if your favorite winery, restaurant or bar might have a dog-friendly al-fresco area. A multifunctional leash will come in very handy in those locations – simply attach it to a leg of the table you’re sitting at (or chair you’re sitting on), and working on the “stay” will become a breeze. small animals for sale like birds, fish, and guinea pigs. Don’t forget to arm yourself with tasty high-value treats or your dog’s favorite toy to entice and reward good behavior! Another great opportunity to improve your dog’s ability to hold his stay are trips to your vet’s or groomer’s. He’ll be able to practice focusing on you instead of other pet patients and grooming clients. 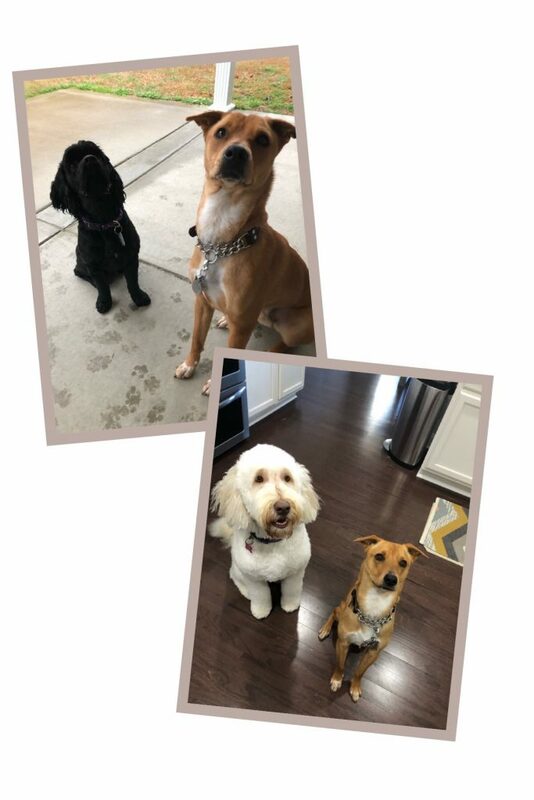 A dog training facility gives you the opportunity to practice your dog’s impulse control specifically around other dog students in a controlled environment. It’s certainly on Wally’s and my list of things to do. Your yard: Small animals like squirrels, rabbits, cats, birds, people walking by your fence, a favorite toy you throw for your dog! 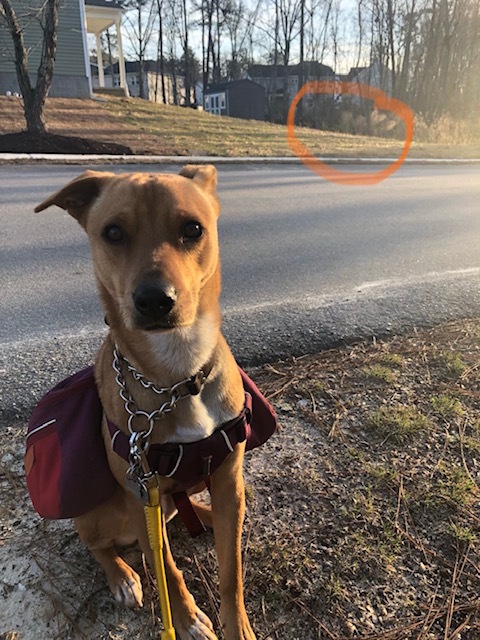 Wally LOVES chasing cats and is still extremely distracted by them both on walks and in the backyard. So far, he’s unable to hold a “stay” at all when cats are around, even with Goldendoodle Lulu being 100% calm next to him! 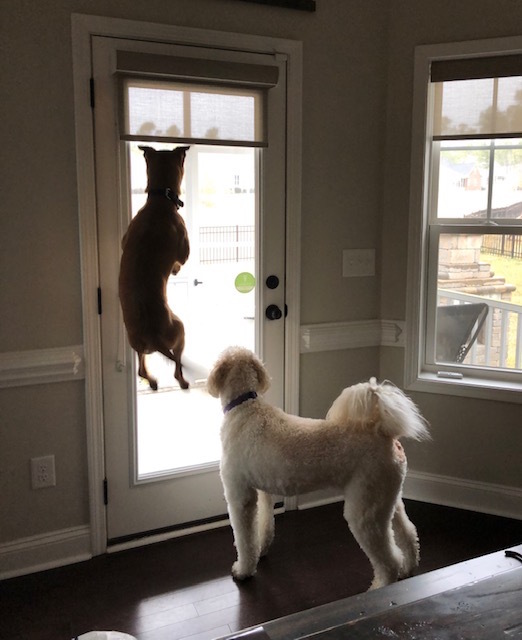 Wally’s reaction when seeing cats – the boy can jump! The only way I figured out of redirecting him from his cat craziness is by physically removing him from the cat surroundings. I’ll usually put a leash on him and take him outside for a quick 5-minute walk to snap him out of his overly excited state of mind. Or I’ll walk him into a different room. He’s able to calm down and focus on me when we move to a different location together, but even the most high-value treats can’t trump cats for now when they’re within sight. I don’t know if that’ll change at some point – we’ll see and I’ll keep you posted! 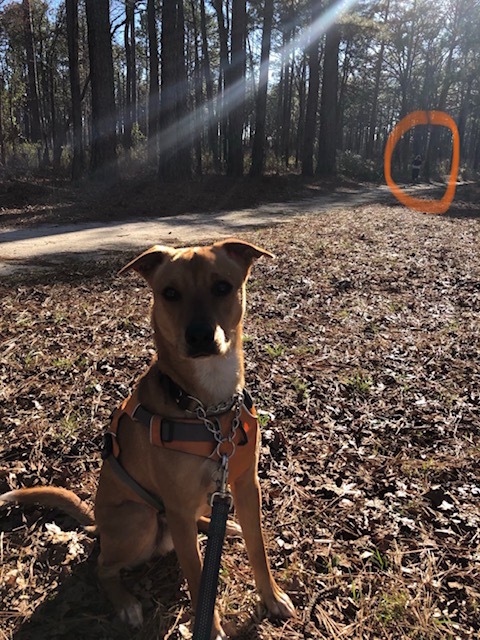 He’s similarly excited around squirrels, although I’m able to redirect him eventually by holding a high value treat right under his nose and slowly moving it away from the direction the squirrel is in. 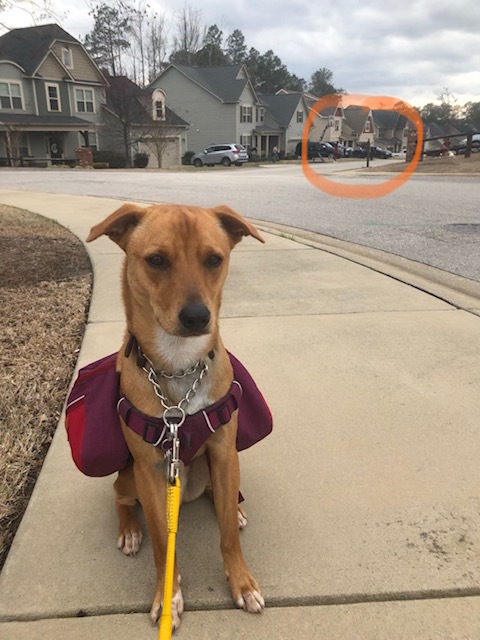 I’m also able to redirect his focus when I’m asking him to “sit-stay” in close proximity to a fenced-in yard with a barking dog on the other side of the fence. The same goes for encountering geese on our walks around the neighborhood pond area. A tasty, high-value treat held under his nose and moved in the opposite direction of the geese works surprisingly well. Mastering the “stay” around a varying degree of distractions is no easy task, but it’s well worth pursuing. It boosts our dogs’ confidence and can keep them out of trouble and potentially dangerous situations. Wally and I are continuing to make progress on this leg of our training journey, but we still need to master the cat obstacle. I’m not sure if he’ll ever be able to fully concentrate on me when his feline nemesis are around. It would be nice if I could at least tone his excitement level and bounciness down a little! Does anyone have some advice regarding Wally’s issues around cats? Also, how does your dog do with “stay” around distractions? Do you have any good challenges the rest of us could try? 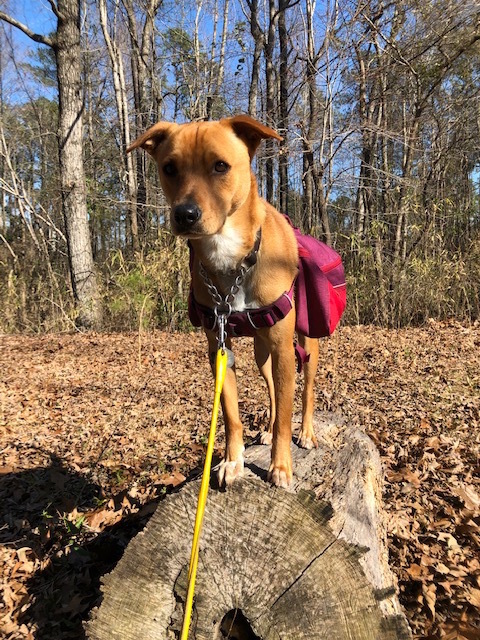 Barbara Rivers writes about raw dog food, dog training and life with her newly adopted dog, Wally West. She owns her own dog walking and pet sitting business in North Carolina. Wally is an active, 1.5-year-old Feist mix. Follower their blog K9s Over Coffee. Oh my goodness. What great pictures. I love the one where he’s looking at Lulu. I feel like he’s saying, “Am I doing this right? I’m a good dog too, right?” His jump is insane! Holy cats. It looks like you’re already doing this, but our technique is to incorporate a hand motion when we give the stay command. A firm stop sign fairly close to his face helps to get his attention before we move away. Deliver the stop sign while facing your dog squarely with an upright assertive posture. Body language is a really powerful part of training and can communicate a lot. Yes, I use a hand motion as well. Yep, I use my hand as well. I start with my palm right in front of his face and keep holding it up as I slowly step backwards. Thanks Julia – omg, him and the cats. I’ll have to take a video of his jumps. It’s like he’s wearing springs under his hind paws! Yes, I’m definitely using a hand signal as well. Gosh, I would say Wally is doing really, really well especially since you’ve only had him two months. That’s tremendous progress! I’ve had reasonable success in teaching our dogs to stay, but I gotta admit, I never did much other than working on it inside the house and a little in the yard. So I guess that’s not really reasonable success at all! The photos of Wally and LuLu are just great. They made me laugh out loud. The copy-cat one reminds me of when we had two goldens and we were tossing sticks into Lake Superior. The younger one had no idea what to do until she observed the older one swimming and retrieving and then it was a like a light bulb went on. The photo of Wally jumping made me wonder what Lulu was thinking. Ha. And I’ve always used a handle signal too when working on stay. Thanks Nancy. Isn’t it funny how dogs can learn from one another?! I’m picturing the light bulb moment of your younger Golden when she figured out how to retrieve. I’m sure that step by step you’ll manage to curb his cat enthusiasm.